I’ve been teasing you to this gentle giant for weeks now. I’ve taken you through the entire process and now it’s time for the big reveal! I’m really blessed to now call myself a designer for Yarnspirations, a company I have love and trusted for years. We collaborated on this mega knit throw this month to bring you a free pattern and complete video tutorial that will walk you through the entire process. If knitting is still very new to you, have no fear. This mega knit throw is the ideal beginner project. We all need a few things as a beginner knitter – instant gratification, easy instructions and someone to show you how to do it. We have covered all these things with this project! Bernat Mega Bulky yarn fits in the largest category of yarn, jumbo #7. It works up lightning fast. Each stitch measures 1″ x 1″, that’s serious in the world of knitting and the epitome of instant gratification! If you’ve enjoyed any of my videos before and you’ve grown fond of my teaching style, you’ll feel right at home with this tutorial. The pattern may live on Yarnspirations website but it’s still the same teacher you love! Even if you have a dozen other projects on your needles, the mega knit throw is something you should consider. You’ll have a brand new throw in one productive weekend! As I mentioned above, I have recorded a step-by-step video tutorial to help you through this project. When you click on the link below, you’ll be directed to the video tutorial. If you haven’t done so already, have a look at the pattern and the video tutorial. Using the links above, you have access to all the information you need to decide if the Bernat Mega Knit Throw is the right project for you. I know you’ll have as much fun as I did with this project. If you need any help whatsoever, I’m here for you! 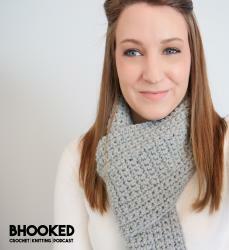 Please don’t hesitate to reach out to me via email – knitting@bhookedcrochet.com – or leave a comment below. I’ll answer any questions that may come up!